8 Also at the same time Solomon kept the feast seven days, (7) and all Israel with him, a very great congregation, from the entering in of Hamath unto the river of Egypt. 10 And on the three and twentieth day (23RD) of the seventh month (MARCH) he sent the people away into their tents, glad and merry in heart for the goodness that the LORD had shewed unto David, and to Solomon, and to Israel his people. I'M GOING BY SEPT 1, AS ROSH HASHANA AS MONTH 1 IN ISRAEL FROM VERSE 10.THIS IS INTERESTING THAT PASSOVER IS ON MARCH 25,13.2 DAYS AFTER SOLOMON FINISHED THE TEMPLE.DO WE SEE COMPARISONS HERE.JUST MY THOUGHTS.BUT GREAT 8 DAY COMPARISON TO PASSOVER AND THE FINAL BUILT TEMPLE TO SACRIFICE TO GOD IN. 1ST DAY OF PASSOVER IN ISRAEL TODAY. Pope Francis extends Passover wishes to Jewish community in a gesture aimed at strengthening relations between the two religions. 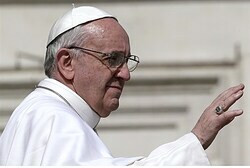 Pope Francis on Monday extended his wishes to Rome's chief rabbi and Jews worldwide in a gesture aimed at strengthening relations between the two religions, as the Jewish world marks the beginning of the holiday of Passover.In his message to Rabbi Riccardo di Segni, the pope said he hoped "that the Almighty, who freed his people from slavery in Egypt by guiding them to the Holy Land, continues to free them from all evil and accompany them with his blessing". "I ask you to pray for me, as I assure you my prayer, confident of being able to deepen the bonds of mutual respect and friendship," he said in the statement made public by Rome's Jewish community.A large delegation of rabbis attended the pontificate's inaugural mass on March 19, underscoring the strong ties between the two religions.Under his predecessors, late pope John Paul II and "pope emeritus" Benedict XVI -- who stunned the world by becoming the first pope to resign in 700 years -- Jews and Catholics were also considered as brothers "in faith".In contrast, the Muslim delegation was represented only by lower-rank figures at Pope Francis's inauguration mass, illustrating the strained relationship between the two faiths.Last week however, the pope called for the Roman Catholic Church to "intensify" its dialogue with Islam, echoing hopes in the Muslim world for better ties with the Vatican during his reign.